(Last Updated : 18.04.19). 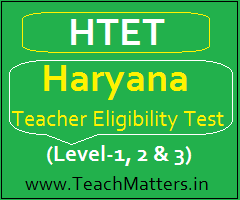 Download HTET 2018 Result Final Answer Key HTET JAN 2019 Question Papers : Check Here Latest News on HTET 2018-19 Exam for Level-I, II & III - Haryana Teacher Eligibility Test 2018 was conducted on 5th & 6th January 2019. HTET Result, Answer Key & Question Papers Exam 05-06 Jan. 2019 for Level-I (JBT), Level-II (TGT) & Level-III (PGT) Exam JAN 2019 can be downloaded here as the official answer keys are uploaded on the official website of HBSE HTET i.e. www.hbse.ac.in or www.bseh.org.in & www.htetonline.com or www.htet.nic.in. The Government had revised the Syllabus i.e the Scheme/ Structure and Course Content of HTET Examination w.e.f. 2017. Candidates who are appearing in Haryana TET Exam 2018 can check latest news through official website i.e. www.htet.nic.in or www.htetonline.com as per the schedule uploaded by the HBSE. Check here latest updates on HTET 2018 Answer Key JAN 2019 Exam Result, OMR Sheet Images, Revised Syllabus, Exam Pattern, Eligibility Criteria, Mock Test, Admit Card, Question Paper, Answer Key, Result Analysis and Statistical Report for HTET Level-I, II & III Exam 2018. Download HTET Answer Key 2018 Exam Paper Solution January 2019. (Last Updated : 16.04.19). 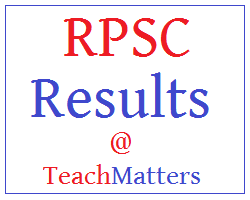 Check RPSC 2nd Grade Teacher Result 2019 Cut-off Marks subject-wise and category-wise. Rajsathan Public Service Commission (RPSC) released latest result of 2nd Grade Teacher Comp. Exam 2013. The 2nd Grade Teacher Exam 2016 was conducted on 26.04.2017 & 01.05.2017 for GK Paper 1. Optional Paper 2 exam was held in June & July 2017. The result and cut-off marks of Senior Teacher Grade II Exam 2016-17 was declared by RPSC after the completion of the exam. Check here Reshuffle Result & Cut-off Marks 2016 of Sr. Teacher Grade II Exam 2011 for the post of TGT Hindi, English, Science, Social Science & Mathematics against 5% vacant posts in accordance with the Decision of High Court Writ Petition No. 795/15 Radheshyam Godara & others vs RPSC & others 21.09.2015. All candidates who are declared provisionally qualified for the post of Sr. Teacher GR II are required to submit Detailed Application Form as per the schedule. See here the result & cut-off marks of 2nd Grade Teacher. (Latest Updated : 16.04.19). 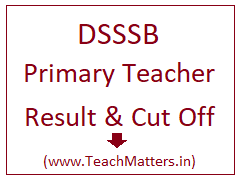 DSSSB PRT Result 2019 Cut Off Marks : Primary Teacher Result Delhi Teacher Cut-off Marks List - Check Latest Result and Cut Off Marks of Primary Teacher Recruitment 2018-2019 in Delhi through official website of DSSSB i.e. www.dsssbonline.nic.in. Delhi Subordinate Service Selection Board declared written test result marks of Primary Teacher Primary (MCD), post code 89/17, 01/18 & 16/17. Before this, the Board conducted the Written Test (PRT TIER-1 Exam) 2018 on 30 September 2018 and 13, 14 & 28 October 2018 for the post of MCD Primary Teacher Post Code 01/18 & 16/17. Candidates who have appeared in the exam are searching for Primary Teacher Expected Cut Off Marks 2019 for post code 01/18 or 16/17 PRT Exam September-October 2018 so that they can get an idea about tentative cut-off marks for qualifying in the PRT Result 2019 for post code 16/17. 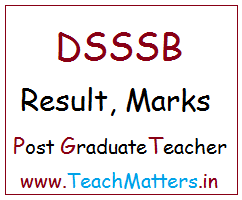 Check here latest DSSSB Primary Teacher Result 2019 Cut Off Marks (Expected & Official), Merit List and list of Selected Candidates for Document Verification and Final Result for the post of Delhi PRT Teacher. (Latest Updated : 16.04.19). DSSSB PGT Result 2019 Marks List - Delhi Subordinate Service Selection Board (DSSSB) declared Written Exam Marks List of Shortlisted Candidates of various posts of PGT exam held in July & August 2018. Earlier, Delhi SSSB declared Final Result and Selection List for the post of PGT Fine Arts & Home Science. Before this, the Board declared Revised Result of PGT PHE, PGT English, PGT Sanskrit, PGT Commerce, PGT History, PGT Sociology, PGT Music, PGT Biology, PGT Maths, PGT History, Political Science, Geography, PGT Economics, PGT TIER-II Exam 2015 for the post of PGT Maths, PGT Chemistry, PGT Sanskrit, PGT Home Science, PGT Engg Drawing, PGT Physics, PGT Agriculture, PGT Urdu, PGT Punjabi & PGT Painting. The Board uploaded Provisional List of Shortlisted Candidates for the above said posts for Document Verification. See here PGT Result 2019 List of Shortlisted Candidates, Cut-off Marks List, Document Verification Schedule and final selection list.